Get an insight about Panama by reading the general information about the country and detailed reccommendations on country's cuisine, attractions and more. 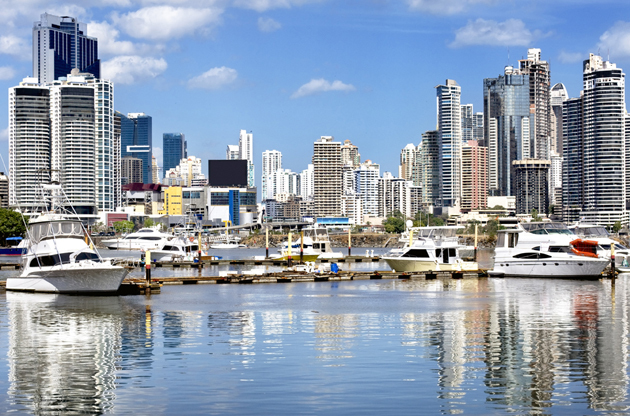 Invaded, explored, and settled by Spaniards in the 16th century, the place shares plenty of Latin American culture, but in terms of business and finance, Panama has more in common with its northern neighbors. Panama as a tourist destination has exploded over the past decade, with such rich and varied regions; it’s no surprise that people are drawn to the small but diverse country. In fact, Panama boasts some of the highest numbers of different species in the whole world! Even the countries name ‘Panama’ means "abundance of fish"; this reflects a lively fishing economy, as well as the countries reputation as a hotspot for water sports. Its rainforests are an extremely precious habitat for thousands and thousands of amazing plants and animals – and all concentrated between two different oceans, and into a country smaller than South Carolina, pretty astounding, right? The landscape in Panama is pretty rugged, and they say that from the highest point in the country - Volcan Barú, you can see both of the oceans. Whatever brings you to Panama, you are guaranteed to leave with the experience of a lifetime under your belt – see, taste, and explore, from the thriving rainforests to the buzzing cities. The country is a rich cultural melting pot in the grip of huge economic growth – which makes it perfect for holidaying somewhere new and exciting, and doing business somewhere impressive and prosperous. Panama is a small, sun-drenched, Spanish speaking country at the southernmost point of Central America, bordering on Columbia and Costa Rica. It’s a long and narrow ‘S’ shaped country famous for it’s active trade canal that’s stretches almost 50 miles, and connects the Atlantic to the Pacific. While many visitors are unlikely to need a visa to enter Panama, it is important to check before you travel, those entering with a passport are often required to have a return ticket exiting the country, proof of your accommodation- or a willingness to book it from the airport. While modern, urban life is buzzing away in the cities, traditional native life continues to thrive elsewhere, and you can get a taste of both, while visiting the country. A thick belt of rainforest circles the chic metropolis of Panama City, which is likened to Miami, and is an established centre of arts, fashion, commerce, and dining. If you step out of the urban centres, and head to mountains or the rainforest, you will notice that the indigenous tribes of Panama continue to thrive. They live very simple and traditional lives, and the opportunity to visit them and understand their culture is a great experience. The Panama Canal is a historic waterway which will teach you lots about Panama’s recently won independence. The dense and exciting rainforest and jungle museums, where you can learn about wildlife, the ecosystem, and the dramatic Panamanian landscape. The Panama Viejo ruins –the dramatic remains of the old Capital city, ransacked and burnt to the ground by pirates centuries ago. The walled Casco Antiguo or ‘Old Quarter’ in the new Capital city, steeped in history and beautiful buildings. Panamanian food contains Afro-Caribbean, French and Spanish influences and is typically much more varied and much less spicy than the rest of Latin America. In the cities of Panama you will find great seafood and gourmet cuisine from all corners of the world, but venture from these centres and you will be hard-pressed to find alternatives to Panamanian dishes. However, Panamanian food can be exquisite, with freshly caught fish, and free range beef. This great food tends to be extremely cheap too; from small street-food café’s called ‘Fondas’. The currency of the country is known as the Balboa, but is floats alongside the dollar. Both currencies are accepted readily in Panama and are always 1:1. Panama is a large free trade zone, and houses many large western-style malls, pricing varies from place to place and product to product, but it’s generally a good country to buy clothes or cosmetics. This said prices are usually on par with U.S. prices. As well as the large malls, one of Panama’s most popular shopping spots is El Valle. Here you can find much more traditional Panamanian handmade goods, and is home to one of country's largest handicrafts market. Find fresh foods, carved woods, beautifully painted gourds, hats, and much much more. Panama has been gaining more attention by the large scale event organizers recently. The number of the events that are held in the country has increased significantly thanks to the charm of Panama and the improvements on event tourism sector regarding the country. Every year a large number of congresses, conferences, symposiums, fairs and trade shows are held in the country and the event attendees get the opportunity to discover the unique attraction of the country and participate in their desired event at the same time.